Head to SeatGeek.com to get NHL tickets! And learn how to find the lowest Stanley Cup Ticket prices via our industry leading tracking of NHL ticket prices. In most professional sports, teams with the best records and teams in the largest markets command the highest average price per ticket in the secondary ticket market. The NHL does not follow this rule. 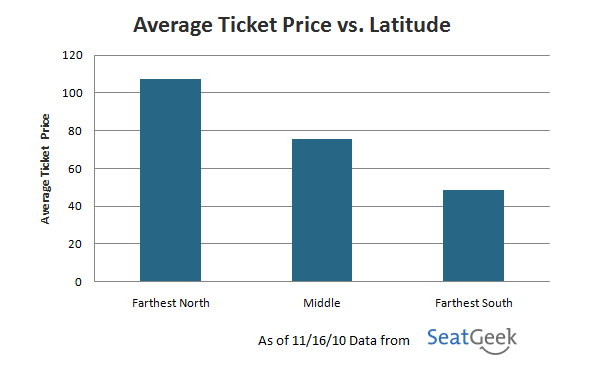 In the NHL, the ticket prices in the secondary market seem to be primarily driven by latitude. For the most part the farther north an NHL team is located, the higher the ticket prices. The chart below breaks the NHL teams down into three groups of 10 based on latitude. There are a few teams that do not follow this trend as well as the rest and are worth taking a closer look. Pittsburgh Penguins – The average price of tickets to the Pittsburgh Penguins games is much higher than expected based on their latitude. There are 14 NHL teams located farther North than the Penguins yet their average ticket prices rank 3rd highest in the league. It is also worth noting that the Penguins are also the only team ranking higher than any of the teams based in Canada. Dallas Stars – The Dallas Stars are the 3rd southernmost team in the NHL. The average price of tickets to see the Stars play is significantly higher than expected based on their latitude. The fact that the Stars are currently in last place in the Pacific makes this even more interesting. Detroit Red Wings – The Detroit Red Wings are in first place in the Central and are the 11th northernmost team in the NHL yet their average ticket prices rank 25th in the NHL. A weak local economy might be the cause of the low ticket prices.